When it comes to taking medications in pregnancy, there is one major rule of thumb that all pregnant women need to follow – always ask your obstetrician about the safety of the medication before taking anything. This includes asking your obstetrician about over the counter, herbal, natural and prescription medications. If you are currently taking a prescription medication and you’ve found out you’re pregnant, continue taking the medication and contact your gynecologist, obstetrician or family doctor immediately. Not all prescription medications are safe for use during pregnancy, but in some cases physicians need to replace the medication with a safer alternative, especially if the prescription is needed for the general health and wellness of the pregnant woman. Obstetricians are versed in safe and effective prescription medications for use during pregnancy. If you are prescribed a medication by your obstetrician, it can be assumed the medication is safe. However, if you are not showing and your family physician is unaware of your pregnancy, it is important to talk with the physician about pregnancy safe medications and ask about the safety of the prescribed medication before taking even one dose. Not all over the counter medications are considered safe during pregnancy. Ask your obstetrician for a list of pregnancy-approved over the counter medications. Keep the list on the refrigerator or in a safe place you will remember so you can access it when you suffer common ailments like headache, body aches or the common cold. Most herbal supplements are not tested on pregnant women. It is best to ask your obstetrician about any herbal supplements you are currently taking or wish to take. It is best to stop taking herbal supplements as soon as you find out you’re pregnant to protect the health of the fetus. If the herbal supplement is considered safe for use during pregnancy, you can resume taking the supplement after doctor approval. Many prescriptions, over the counter and herbal medications are not tested on pregnant women so there is no steadfast list of effects the medication could cause during pregnancy. 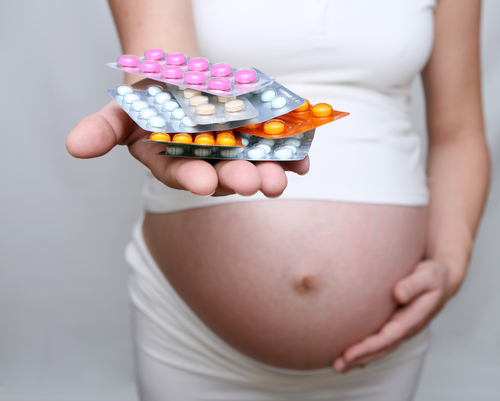 The Food and Drug Administration categorizes medications based on safety in pregnancy. However, newer drugs are not categorized as quickly as they are available for prescription. The FedWatch Program enables drug companies and doctors to report adverse side effects association with taking prescription medications, including any adverse side effects noted during pregnancy. When in doubt, it is best to ask your obstetrician before taking any form of medication, whether prescription, over the counter or herbal.